I was visiting my sister-in-laws facebook page and stumbled upon this recipe from Joy the Baker. Once I saw it though, I HAD to make it! And let me tell you, it is totally worth the time it takes! While the dough rises, whisk together the sugar and cinnamon for the filling. Set aside. Grease and flour a 9×5×3-inch loaf pan. Set that aside too. Use a pastry brush to spread melted butter across all of the dough. Sprinkle with all of the sugar and cinnamon mixture. It might seem like a lot of sugar. Slice the dough vertically, into six equal-sized strips. Stack the strips on top of one another and slice the stack into six equal slices once again. You’ll have six stacks of six squares. Layer the dough squares in the loaf pan like a flip-book. Run a butter knife around the edges of the pan to loosen the bread and invert onto a clean board. Place a cake stand or cake plate on top of the upside down loaf, and carefully invert so it’s right side up. Serve warm. I just made a pull apart bread for the first time too! 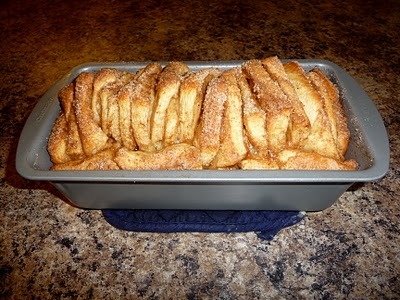 I think this is a very similar recipe ,but I changed the cinnamon/sugar to chocolate and butterscotch. I look forward to trying this one too.